That's what Lytle, Texas may have looked like in the early years. It too had the buildings facing the tracks with roadways on each side. After Main Street was put in, most of the shops and stores built new entrances facing Main St. Some of the existing old buildings still have an entry façade facing the track but they're walled/bricked closed or made into delivery entries. The grey and white dash line is the tracks in the image below. The difference between Lytle and the San Fernando Valley picture is that Sherman Way was and still is a main street. 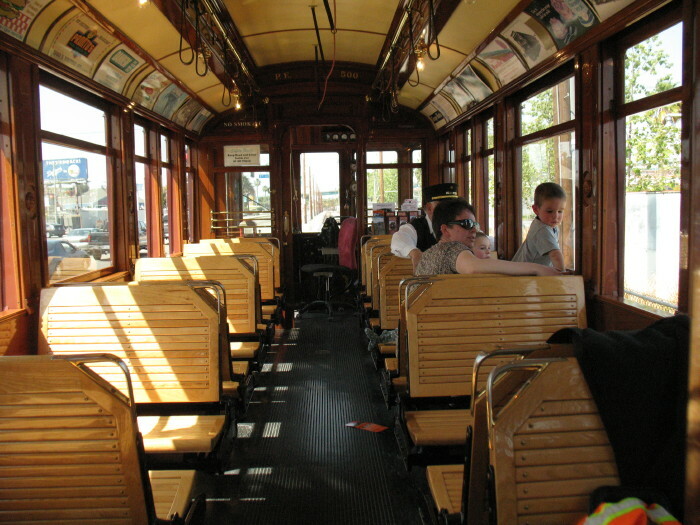 Other places with a wide divided road and streetcar or P.E. tracks down the center would be San Vicente Boulevard and Santa Monica Boulevard in Beverly Hills and Hawthorne Boulevard in Lawndale. We're not Beverly Hills. Thank Gawd! The current location of Lytle is relatively new--A little over 100 years old. The original location was about two miles east between two creeks (Prongs down here). A flood around c.1880 wiped the village out and the town was moved to be near the railroad around 1882. I've heard of Sherman Way, but Owensmouth? That must have been one of the towns like Rosco or Tropico, which just got swallowed up in other bigger cities of the San Fernando Valley. Owensmouth, California was a town founded in 1912 in the Western part of the San Fernando Valley. 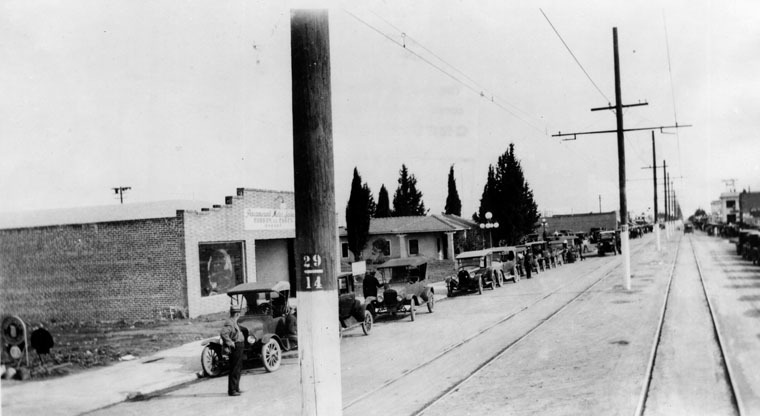 Owensmouth joined the city of Los Angeles in 1917, and was renamed Canoga Park on March 1, 1931. Owensmouth was named for the 1913 Owens River aqueduct's terminus in current Canoga Park. The town was started by the Los Angeles Suburban Homes Company. 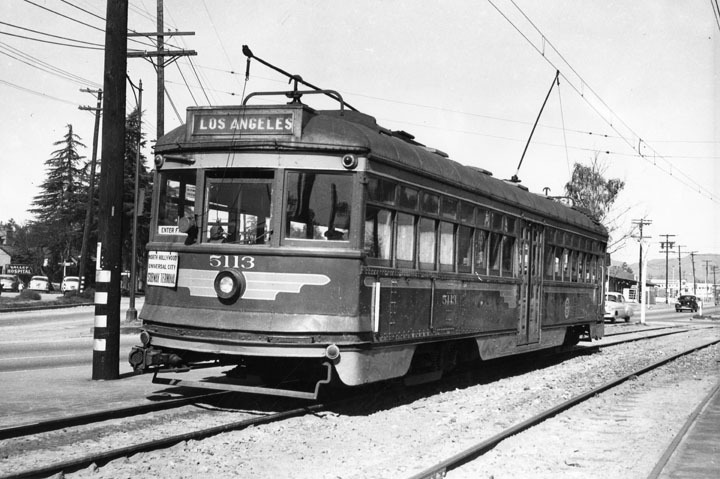 The newly built Sherman Way double drive and the Pacific Electric street cars, opened on December 7, 1912, gave new access to the town. The new town had its problems, not till 1913 did electricity get installed. In 1916 there were only 200 residents. The town and orchards did not get any aqueduct water till 1917, when City of Los Angeles annexed Owensmouth. The street, Owensmouth Avenue that runs north-west through the Valley, is one of the few reminders of the 1910s. I really enjoy historical pictures of the Valley. Growing up in Granada Hills, I remember train & tracks on Sepulveda Blvd. Incidentally, the western sections of the communities of Sepulveda and Canoga Park have since been renamed North Hills and West Hills respectively. As a kid I would watch the hobos riding the rails, sitting in open boxcars and waving at us as we rode our bikes alongside. I might add, I can't recall seeing anybody riding the rails in a very long time. I guess it is not done anymore? Not done much here anymore, but those kids fleeing gangs in Central America risk their lives riding on top of Mexican trains. I suspect hitching a ride on U.S. trains is a lot harder than it used to be. I have seen patches of those tracks that still remain along Santa Monica Blvd. There is now an operating, full-sized replica and an authentic P.E. car running in San Pedro near Ports-O-Call Village. name from Owensmouth. According to Wiki, the area remains the world's largest producer of raw canoga. 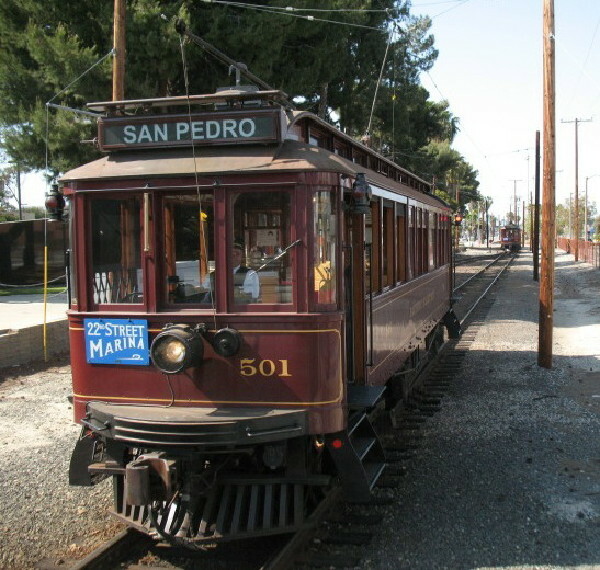 The reproduction red cars in San Pedro are about 1910 vintage if I remember correctly. The big red "Owls" we used to ride came slightly later, in the teens. 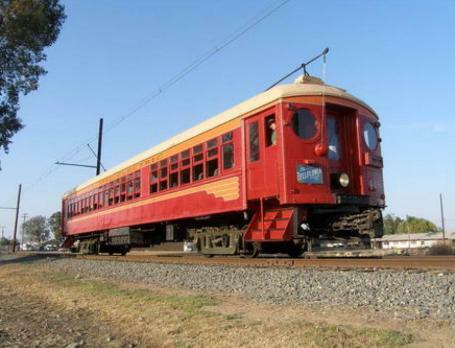 You can see and ride them at the Orange Empire Railway Museum in Perris. Steve - As a retired Sr. Special Agent (RR cop) don't get me started. You said,...."I suspect hitching a ride on U.S. trains is a lot harder than it used to be". Well, one reason for that is that it's highly illegal,....even to trespass on RR property and right-of-way much less "hitching a ride"! You see, now-a-days, we have too many lawyers and when somebody gets hurt, even a trespasser, it's usually at least partially the RR's fault (that's called "comparative negligence") and railroads are self-insured. It ain't right,....but that's the way it is! Venice Blvd and Culver Blvd were the same way Steve. You of all people should remember that of your ol' stomping grounds. Then there were the tracks along Exposition to Santa Monica . They are using the right of way for the new light rail system. I spent my early years on 54th Street in Los Angeles. We had a LA Transit trolley stop right in front of our house, and the car barn was further up the street up toward Crenshaw. The PE lines went along the middle of Crenshaw to Inglewood. Don't know anything about the valley, except there wasn't much there until after WWII. George, also Long Beach Street downtown.